“In the heart of Bunbury and only a stone’s throw from the Leschenault Inlet and the beautiful Koombana Bay, Leschenault Village is buzzing with activity and awaiting the company of seniors with a real zest for life. Comprising 38 units and home to many long-term residents, the village clubhouse has undergone significant upgrades in keeping with the expectations of its current residents. Masonic Care WA Chief Executive Officer Marie-Louise MacDonald said the company purchased the village in 2016 and set to work refurbishing the units. “The new generation of retirees are expecting villas with all the comforts of their previous homes and do not want to compromise on quality when looking to downsize,” she said. One significant example is villa 18; undergoing a total transformation, the villa was completely stripped and taken back to bare bones to allow the builders to create a highly functional and luxurious home. The kitchen was enlarged to increase the amount of space available – an outcome any aspiring master chef would be proud of. With new stainless steel appliances, acrylic benchtops, plenty of storage and an ample supply of drawers, the kitchen covers all storage, practical and aesthetic bases. Generating even more visual appeal to the entire area, feature pendants were included to allow additional lighting over the expansive breakfast bar and beautiful subway tiles were used to enhance its modern look and feel. The master bedroom includes built-in robes and a sliding door for seamless access to the outdoor area, while the second bedroom features a stunning decorative Japanese-style screen. “This allows the space to either be utilised as a bedroom or opened up to become part of the living area as a study, reading room or even an additional dining or lounge area,” Ms MacDonald said. Encompassing a beautiful open plan layout, the living area features attractive hard-wearing, wood-look vinyl plank flooring to create an inviting feel. Located in the centre of the village, villa 18 boasts easy access to the village amenities, which include a bowling green, clubhouse, library and pool table. The village also has several visiting professionals available to residents, including a hairdresser, beautician, massage therapist and podiatrist. Bunbury Centre Point shopping centre is less that a kilometre from the village, ensuring residents have easy access to shops and facilities. “Villa 18 is on the market at $355,000, but with villas starting at just $269,000 there is an option to suit all tastes,” Ms MacDonald said. 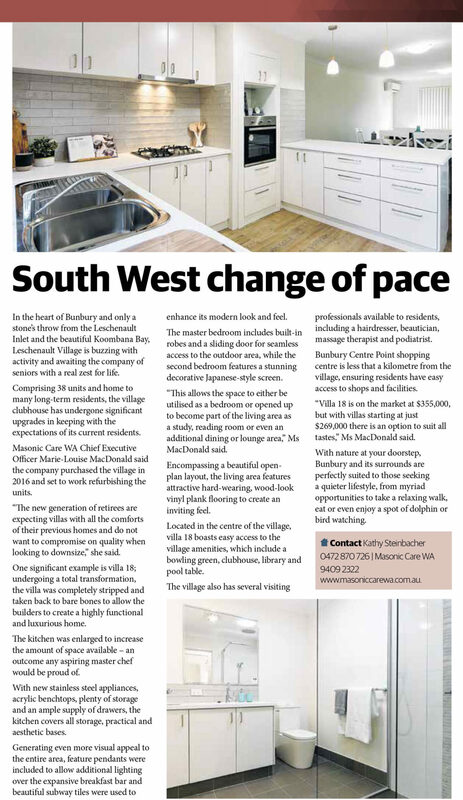 Article written by MCWA’s own Kathy Steinbacher, for more information on Leschenault Village she can be contacted here and edited by Sandra Argese, Journalist at SevenWest Creative. Printed in the Weekend West on the 10th-11th of March.